ATLANTA – February 12, 2019 – The 2018 – 2019 season marks the Atlanta Hawks’ 50th year in the City of Atlanta. In the spirit of their golden anniversary, the team is recognizing the contributions of Atlanta’s icons during its home games. These are the leaders, players, coaches and everyday people whose contributions formed the very foundation for building Atlanta into a national and international beacon of hope, wonder and inclusion for our country, and the world. 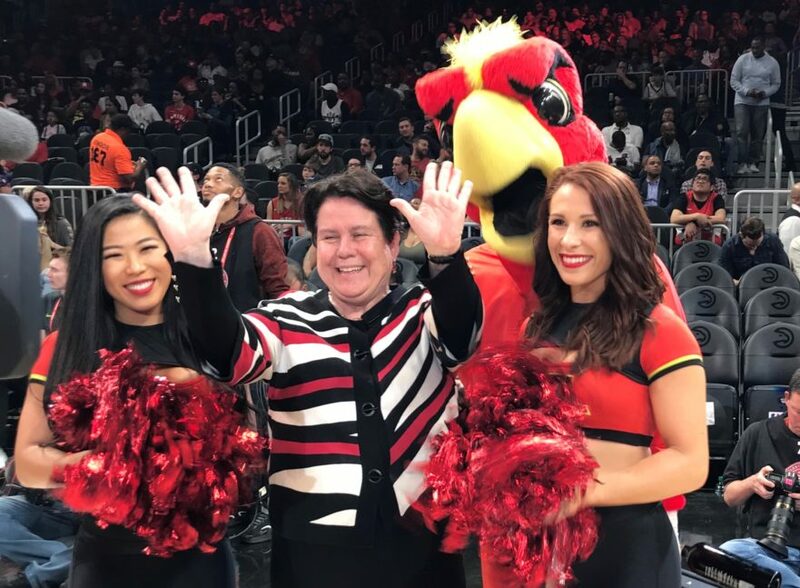 On February 7 the team honored Alicia Philipp, president of the Community Foundation for Greater Atlanta, with a courtside recognition ceremony during their game against the Toronto Raptors. Philipp is among 50 community leaders who are being lauded during the team’s golden anniversary year. Since 1951, the Community Foundation for Greater Atlanta has been connecting the passions of philanthropists with the purposes of nonprofits doing that work. With nearly 70 years serving the 23-county Atlanta region and a robust team of experts, the Community Foundation leads and inspires philanthropy to increase the vitality of our region and the well-being of all residents, empowering our donors to focus on the joy of giving. The Community Foundation is a top-20 community foundation, among 750 nationally, with approximately $1.1 billion in current assets and is Georgia’s second largest foundation. Through its quality donor services and bold, innovative leadership on community issues, the Foundation received more than $144 million from donors in 2017 and distributed more than $100 million that same year to support nonprofits throughout the region and beyond. In 2018 Charity Navigator named the Community Foundation a four-star rated nonprofit, its top distinction, putting the Foundation among the top 10 highest-rated community foundations. For more information, visit: cfgreateratlanta.org or connect with the Foundation via Facebook, LinkedIn and Twitter.